After observing and logging a session, you may want to have quick access to video of the session. Because Morae records using RRT, the resulting video file (RDG) will only play in Manager or the Morae player. To play or edit Morae recordings in programs other then Morae, save or convert your Morae recordings (RDG files) to AVI or WMV files. You can save a WMV file during the recording session. To do this, check Save session as WMV when connecting to Recorder from Observer and select a location to save the file. Saving a WMV does not affect the RDG file. 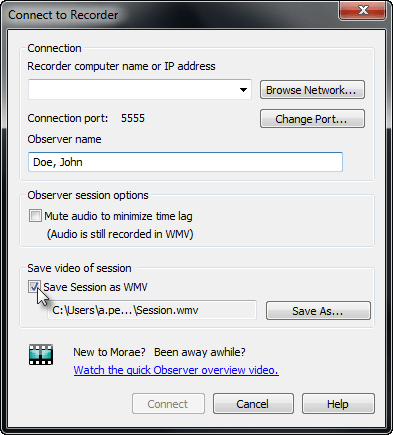 If you mute the audio on Observer during a session, the audio is still recorded in the WMV. After recording a session, you may want to covert the RDG files to an AVI or WMV file. In Morae Manager, open an existing project or create a new project with recording(s) to convert. To open a project, choose File > Open > Project and browse to your project. To create a new project, choose File > New > Project and follow the Create New Project wizard. Choose Create > Storyboard to create a new Storyboard, if needed. If you want each recording as a separate AVI or WMV file, create a separate Storyboard for each recording. Click and drag a video clip onto the Storyboard. Repeat steps 3 and 4 until you have each recording in a separate Storyboard. Click the Produce and Share Highlight Video button from the title bar or choose File > Produce and Share > Highlight Video. The Production Wizard appears and leads you through the production process. Select one or more Storyboards to produce as WMV or AVI videos. Click Next. The Video Encoding Options dialog box opens. To view AVI files produced using the default AVI settings, install the TSCC codec on the computer. Click Next. The Video Size dialog box appears. Set the size of the produced highlight video. We recommend using the default setting, Largest video size. Click Next. The Produce Video dialog box appears. In the Produce Video dialog box, enter the destination folder name and file name for the video and choose the post-production options. Click Finish. The rendering begins immediately. Rendering assembles all of the audio and video data into one video file based on the sequence on the Storyboard. When the rendering finishes, the Production Results dialog box appears. Click Play to view the video.